Following the sellout Australian Premiere at the Melbourne International Film Festival, the inventive time travel comedy The Infinite Man is confirmed for a theatrical release in cinemas across Australia September 18 through Infinite Releasing. The international and local accolades keep coming for the film and its writer/director Hugh Sullivan, who just this weekend won the Best First Feature award at the Fantasia International Film Festival in Montreal, Canada. Hedone Productions also today announced that The Infinite Man has sold to Invincible Pictures for distribution, including a theatrical release, in the US. 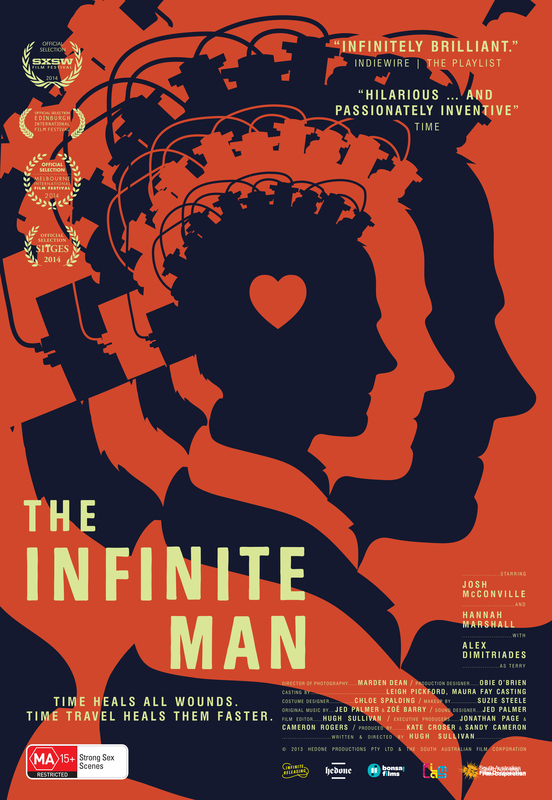 Since the acclaimed world premiere at SXSW in March 2014, The Infinite Man has had selected US screenings, including on a Brooklyn rooftop for the New York Premiere, at California’s Newport Beach Film Festival and at the Las Vegas Film Festival. Also in North America it has screened at Canada’s Niagara Integrated Film Festival, where Hannah Marshall took out the Best Actress Award. Another two prestigious local premiere screenings have been confirmed ahead of the release. The Infinite Man has been selected to screen at WA’s Cinefest Oz as the Margaret River Premiere Film Event on Thursday 21 August and as the Opening Night Green Carpet Gala presentation of NSW’s Dungog Festival on Friday August 29. Starring Josh McConville (The Turning), Hannah Marshall and Alex Dimitriades, THE INFINITE MAN was a smash hit at the 2014 South by Southwest Film Festival, where it made the time.com list of ‘ten films that made SXSW spectacular this year’, alongside Grand Budapest Hotel and Chef and won the Indiewire Critic’s Pick for Best Screenplay and Best First Feature. Australian media have also praised the debut feature from writer/director Hugh Sullivan, with The Music heralding it as ‘One of this century’s great local debuts’, The Age’s Craig Mathieson calling it ‘wonderfully inventive…a kind of deadpan scientific screwball that is delightful’, Luke Buckmaster for The Guardian billing it as one of the ten unmissable films at MIFF, ‘joyfully inventive…a rare find’ and Russell Edwards for SBS crowning it ‘one of the smartest Australian films ever made’. Written and directed by Hugh Sullivan.